Like many people I have spent a great deal of time pondering the horrific events that took place in Sandy Hook at an elementary school (I shudder every time I see those words – elementary school – associated with an event like this). I’m not sure what I learned in all of the dialogue that is out there and I know it will take further time to gain any perspective on this event. What I do know is that I won’t utter the shooter’s name, as I’m trying to etch in my memory the names of those who lost their lives. That’s part of my commitment when I think about the tragedy that occurred. As I listened to the commentary, I was shocked to hear this: “The only thing that stops a bad guy with a gun is a good guy with a gun.” Again, I’m not interested in publicizing the name of the individual who gave the quote but I am troubled by it. Not by the content as much as by the naiveté that underlies it. You see bad guys are not so easy to spot. They don’t self-identify. No one ever speaks after the horrific event and says, “Yeah, we all knew he was a bad guy.” I’m guessing until the gut-wrenching events at Sandy Hook, some might have characterized the shooter as a good guy. He went to shooting practice and became quite proficient long before he became a bad guy. Or how about the guy in Chicago who was arrested after threatening his local school? A regular gun enthusiast who took pride in his 47 guns and $100,000 worth of ammunition – a good guy I suppose. Is he now a bad guy and should we be worried about him? The local police chief stated that he felt the man was “just bluffing when he made the ominous remark during a heated argument with his wife.” Does that return him to the good guy side of the slate? Bad guys aren’t identified as such until after their heinous acts. Perhaps someone has a way of identifying them and ensuring they don’t get weapons but I doubt it. Or how about this information from the Journal of the American Medical Association: Since 1997, at least 427 000 people have died of gunshot wounds in the United States, including more than 165 000 who were victims of homicide. To put these numbers in context, during the same time period, 4586 Americans lost their lives in combat in Iraq and Afghanistan. Were the shooters all bad guys? Could any of them have been good guys, perhaps even part of the suggested “extraordinary corps of patriotic, trained, qualified citizens” that could “join with local school officials and police in devising a protection plan for every single school”? We don’t have a way of identifying most of our bad guys and, notwithstanding a long overdue dialogue on mental health care, many of them appear as good guys for large parts of their lives. That’s why it’s about access to guns and yes, as the numbers above indicate, guns DO kill people. Bad people are everywhere and the fact that on the same day as the school shooting a bad guy in China stabbed 22 elementary school children is proof of this. Here’s the difference – the 22 children in China are all still alive and will be back with their families! As for the good guys (and I use the term as gender neutral)? They are easy to spot. They are the ones at the front of the class or kneeling by a student at their desk or working with them at lunch or coaching their team. They are unarmed but can disarm the most unmotivated student with caring, compassion, and time. I made reference to this in a previous post with a comment from an aspiring teacher who chose to invest time in a student. When she said “but I took a moment…” she touched that child’s life for an eternity. You’ll see the names of good guys on the list below. 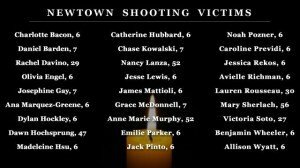 They are alongside the names of a vivacious group of kids who will never get a chance to grow up and experience the true freedoms and liberties of the great nation they live in. And that is the saddest part of this entire event.